NOTICE: Activation key must be used on a valid Steam account, requires internet connection. This product can't be purchased and activated from the following countries:Albania, Andorra, Austria, Belgium, Bosnia and Herzegovina, Bulgaria, Croatia, Cyprus, Czech Republic, Denmark, Estonia, Finland, France, Georgia, Germany, Greece, Hungary, Iceland, Ireland, Italy, Latvia, Liechtenstein, Lithuania, … Luxembourg, Macedonia, Malta, Monaco, Montenegro, Netherlands, Norway, Poland, Portugal, Romania, San Marino, Serbia, Slovakia, Slovenia, Spain, Sweden, Switzerland, Turkey, Great Britain, Holy See (Vatican City State), Aland Islands, Faroe Islands, Gibraltar, Guernsey, Isle of Man, Jersey, Svalbard and Jan Mayen ABOUT THE GAME	The Crazy Chicken first saw the light of day 14 years ago, and has been on lots of adventures since then. 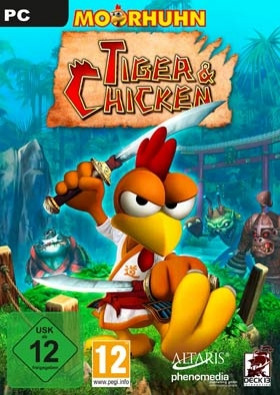 Now it's back to face its biggest challenge yet: In Crazy Chicken: Tiger & Chicken, you play the hero in a fast-paced story filled with terrifying enemies and dramatic combat. As a Shaolin fighter, you must liberate your oppressed people and save the love of your life. KEY FEATURES Action RPG for the whole family	Fight with a variety of weapons Sophisticated skill system Beautiful 3D graphics Supports controllersSYSTEM REQUIREMENTS OS: Windows Vista / 7 or 8	Processor: Dual Core 2.4 GHz Graphics: A video card that supports Shader 3.0 (GeForce 6800GT with 256 MB or more) Memory: Minimum 1.5 GB Ram DirectX®: compatible sound card Published 2016 by Young Fun Studio, a division of Protarius Vertriebsges. mbH, Germany. Moorhuhn and Crazy Chicken are registered trademarks of ak tronic Software & Services GmbH. All rights reserved.